Mother’s Day Audiobooks about mothers and for mothers. I may be a bit biased because I am a mother but I never fully appreciated my mother until I had children of my own. 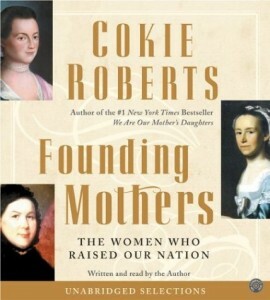 I have highlighted the Founding Mothers audio book by Cokie Roberts because it highlights the contributions of mothers to the founding of the United States of America. As the nation and the world work through the challenging economic times it is very important that the mothers remember that they make a big difference every day. I am planning to download a couple of these audio books and transfer them over to a digital player or burn them to CD for my sister as a Mother’s Day Gift. She has always been a great role model.